Radiofrequency facet denervation (RFD) is used to treat central neck or back pain caused by arthritis. 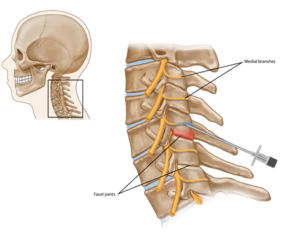 Radiofrequency facet denervation is performed under local anesthetic and with an X-ray to guide a needle to the nerve connected to the damaged joint, where multiple thermal lesions are produced by a radiofrequency generator. The doctor heats the needle to damage a portion of the nerve. This stops that nerve from sending pain signals. It does not damage the joint any further. The procedure is usually performed with conscious sedation by administering medicine to make you relax and minimize discomfort. The goal of facet denervation is long-term pain relief. However, the nerves regenerate, and repeat procedures may be required.